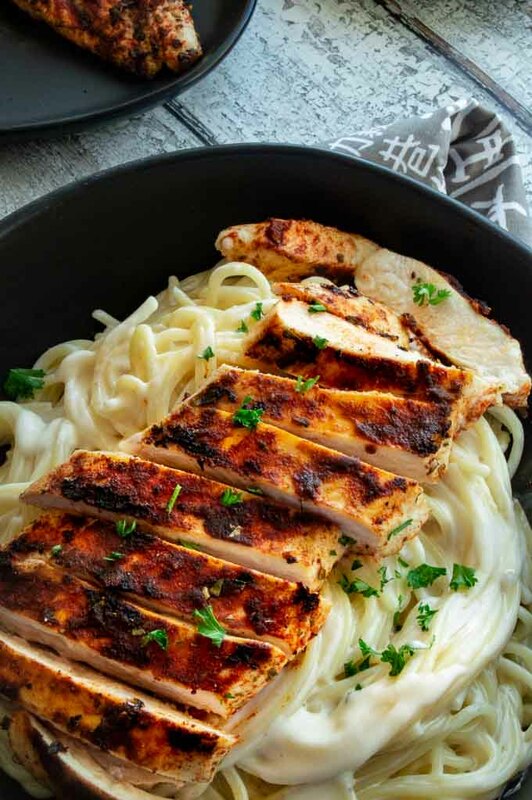 Cajun Chicken over Creamy Pasta: extra juicy chicken seasoned with cajun spices quick sautéed served over tangy creamy pasta. Full flavored chicken makes entertaining easy with this healthier comfort food chicken dinner. 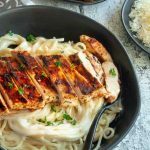 Today’s Cajun Chicken Pasta recipe is a meal that you can have on the table in less than thirty minutes! With everything always busy these days its nice to have a meal that ticks all the boxes for our weeknight dinner or entertaining. I’ve been on a cajun kick recently sharing Cajun Shrimp Mac and Cheese and Cajun Shrimp Boil packet recipes. Life is too short to eat boring bland food and with the flavors of onion, garlic, paprika, smoky chili powder with some herbs there is plenty of flavor punch in cajun food recipes! The chicken is super succulent packed with cajun seasoning and spices with a slight heat that is perfectly balanced with the tangy cheese sauce. A light amount of cheese sauce, just enough that its velvety texture make you want to scrape up every last drop of it! 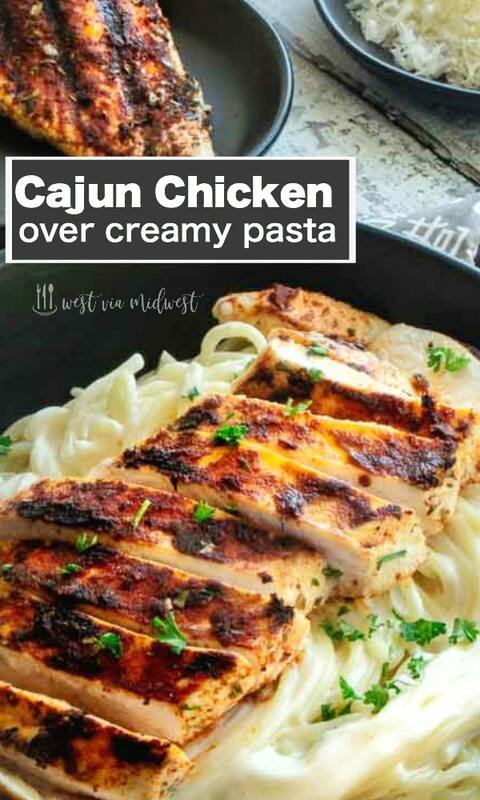 Creamy Cajun Chicken pasta is very easy to make and uses my homemade cajun seasoning mix but you can also use your favorite store-bought brand too. My cajun spices recipe is made with things you already have in your spice cabinet so you wont have to head out to the store to buy it if you decide to make it at the last minute! What’s the difference between Cajun, Creole and Blackened foods? When I made this cajun chicken recipe for some friends for dinner we got to talking about what is the difference between cajun, creole and blackened foods. They have all become intertwined and are often used interchangeably. Paul Prudhomme is the chef that first made blackened foods (starting with blackened fish) very popular. It’s actually a cooking method. Blackening is a process of using a seasoning mix and cooking it in a skillet starting with a very high heat so you sear the spices to the edges of the protein. There is a very fine line between blackening and burning the edges so its a super quick process on high to seal the flavors to the edge then reducing the heat to cook the protein to its perfect doneness. Cajun and Creole both originate from Louisiana and a major over simplification would be to say cajun food is “country food” and creole food is “city food. Today, while there may be subtle differences the words are often used interchangeably. It’s fascinating to me how foods are affected by history. Cajun’s as they became to be known, were originally French colonists that settled in Canadian providences of Nova Scotia and New Brunswick in the 1600’s. Britain tried to rule the area and those people rejected the monarchy. The monarchy seized peoples properties and shipped them off to other places and one of the places they settled them was in Louisiana. Most of those people settled in the country in Louisiana in areas without electricity so their foods were more rustic. A Creole is a person who was usually born in New Orleans (the city) and usually are of French or Spanish heritage. Their foods are a little more refined and have more ingredients because more things were available in the city. You can read more on the subtle differences on the Experience New Orleans website. but for the sake of most recipes on my site I uses spices that are similar to both heritages and use the word interchangeably. All of the foods from the area are bold and full of flavor and are a welcome addition to any menu! LIKE IT? PIN IT FOR WHEN YOU NEED AN EASY COMFORT FOOD DINNER! Start with brining your chicken. (See the pro tip below). Brining your chicken takes just a short time especially when using skinless chicken breasts like I do in this recipe but it guarantees a juicy succulent chicken breast. 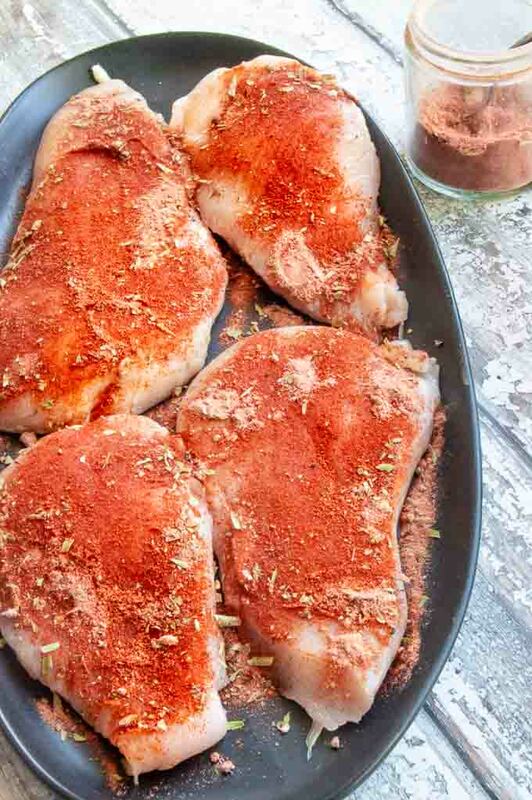 Season both sides of the chicken breasts with cajun seasoning mix. Using a grill stove top pan cook chicken starting with a really high heat to sear on seasoning, then reduce the heat to medium high to finish cooking. 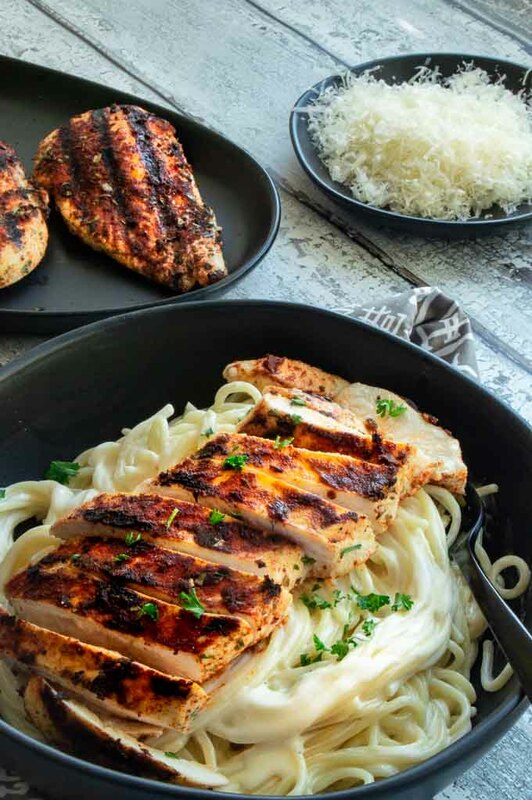 Allow chicken to rest and to let juices absorb back into the fibers while you cook the pasta. Cook pasta, drain the pasta, set aside. 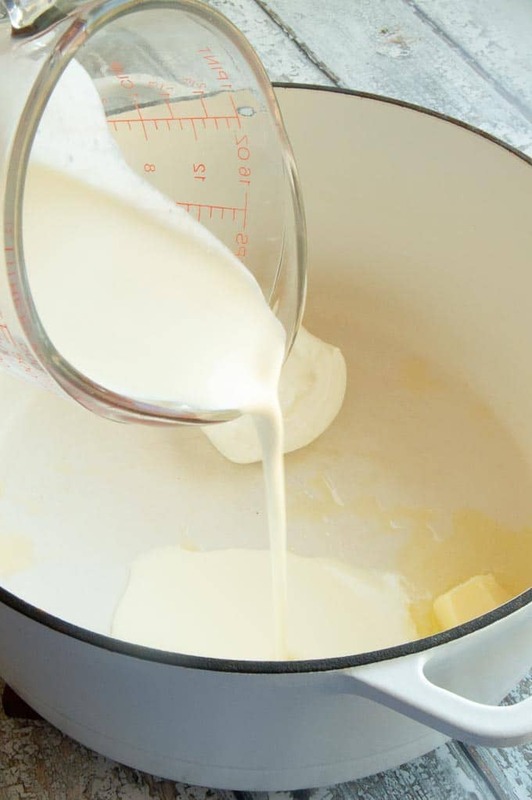 Then in the same pasta pan, melt the butter, add sour cream and milk to form a creamy sauce. 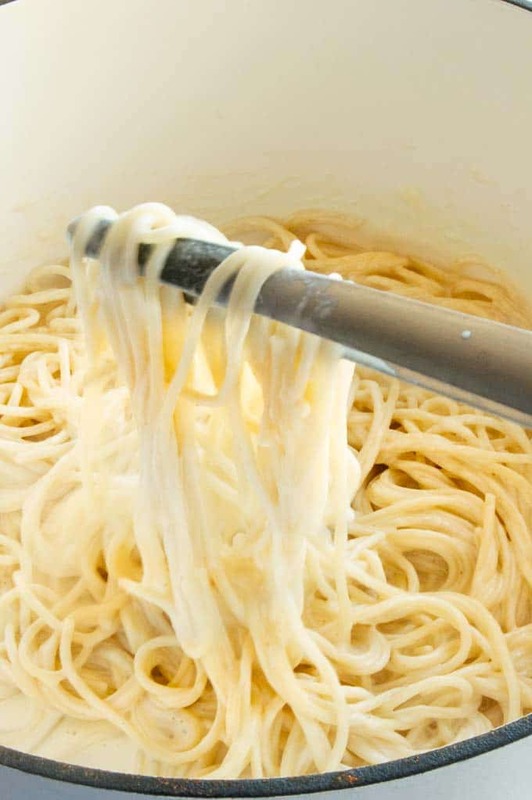 Stir the creamy tangy cheese sauce into the pasta at the last minute before serving. Slice the chicken across the grain to make it even more tender and juicy. Bring the following to a boil on the stovetop. Press out any air and seal the bag and place in the fridge for 60 mins. Remove the chicken from the bag, throwing away the brine. Pat dry and use as you need to for your recipe. Note: Do not leave the chicken in the brine longer than an hour or your chicken will get too salty. You can make it ahead, but store it in a sealed covered container after the one hour of brining. Can I use any pasta? Yes you can. It will work with any pasta just use the same weight amount for the right sauce to pasta ratio. Is this healthy comfort food? It has 600 calories per person with the pasta, but you could serve it with zoodles for a healthier option. It is complete comfort food! Other serving suggestions/ways to use cajun chicken? 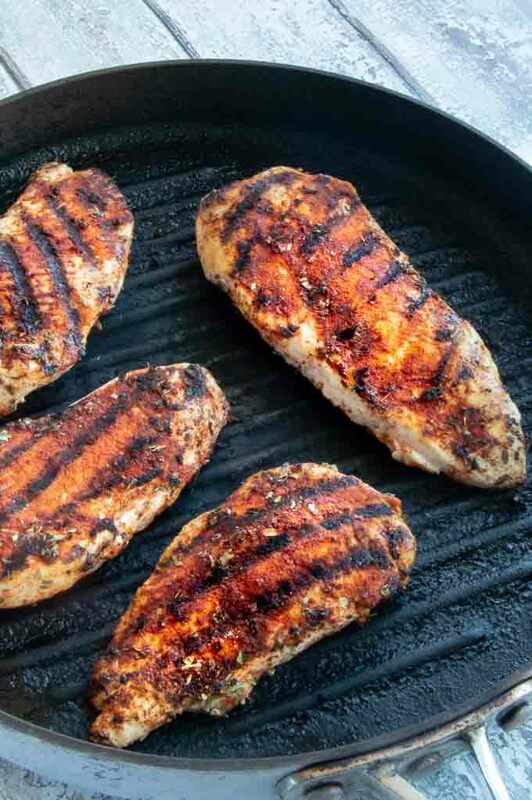 Cajun chicken breasts are excellent the next day for lunch on salads or even freshly made for a salad. You can also cut it up and serve them over a rice bowl. Make a sandwich and flavor the mayo with additional cajun spices for even more of a flavor boost! 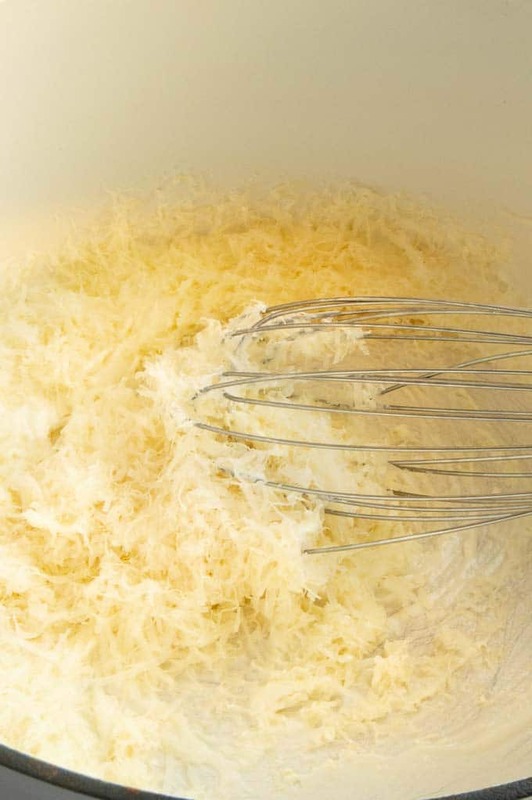 The creamy cheese sauce works great on pasta alone and also as a dip if you dont want to make pasta or zoodles. Can I use other chicken pieces, what about with a bone? Absolutely. The cooking times will be longer with skin and with bone in them, but its totally interchangeable. I still recommend brining, but if you are brining bone in chicken you’ll need to leave it in the solution for 2-3 hours. Other cooking methods for the chicken? You can grill this chicken or bake it just as easily. The baking of a skinless breast I usually do pounded to 1/2″ thickness and bake at 375° for 20 mins then check to see if its done. Add water and salt to a stockpot. Bring to a boil. Add pasta and cook according to the instruction on the pasta. Drain out water and leave pasta in the strainer. Put that stock pot back on the stove on low temp and add butter and allow it to melt. 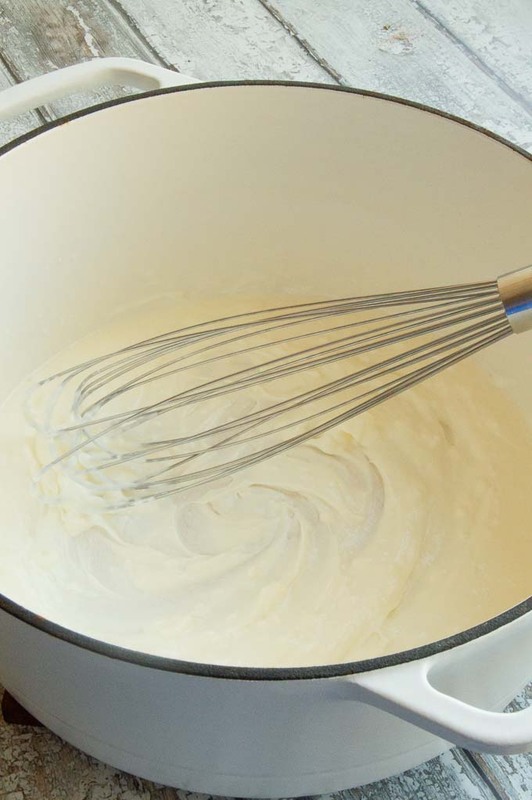 Once the butter is melted add sour cream and milk and whisk until well blended. Add parmesan, stir well and set off hot burner until you are ready to add to the pasta. Place brined chicken on a plate and pat dry with paper towels. 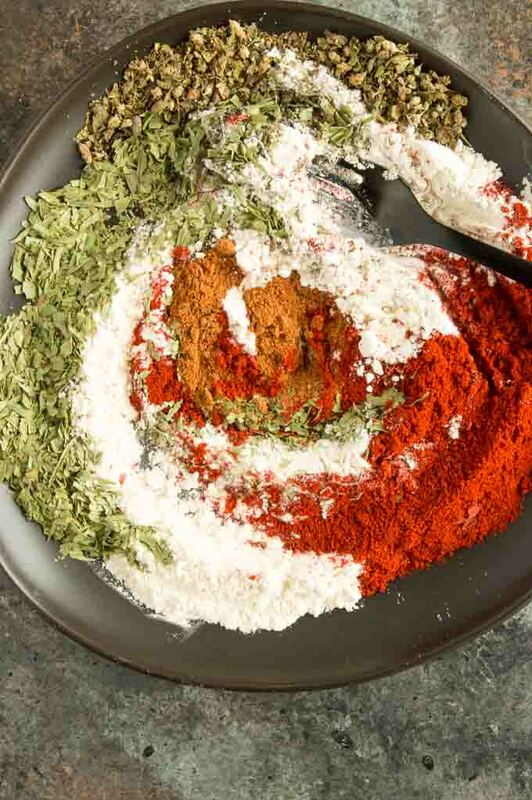 Sprinkle cajun seasonings over both sides of chicken breasts pressing spice mixture firmly onto chicken breasts. Heat a grill pan, or cast iron skillet to high. Place chicken into the pan when hot and sear and cook for 4 mins. Flip then cook for 2 more minutes searing other side. Reduce the heat to low, then cover and cook for 10 more minutes until chicken is 160° and is white in the center. (Use a knife to test in the thickest area) See notes. Remove from skillet, allow to rest for 10 mins while you dress the pasta. Turn the heat to low, and rewarm the pasta sauce. Once warmed add pasta and stir to coat. Once chicken has rested cut it into slices and place on top a plate of creamy pasta. See the post for the quick brining suggestion. Chicken cooking times are approximate, it all depends on the thickness of your chicken. I pound mine for quicker cooking. Make sure to cut into the thickest part to check to see if the chicken is cooked. The chicken should be opaque (solid white, no pink) and the juices should run clear. This meal has my full attention! Looks delicious! Made this for dinner last night- the flavor profile is amazing, and the whole family loved it! This chicken looks so healthy and flavorful! I was looking for a recipe like this! So flavorful and delicious! Need to try this soon! Such an incredible dish!! I am loving the cajun chicken!! YUM!! This looks so good. It reminds me a favorite dish at a restaurant that I haven’t had in years. Must make it soon. Wow, this recipe is perfect for dinner! This sounds fantastic! Looks tasty! This recipe is perfect for me and my family. Thank you! I love the way the spicy chicken plays off the creamy pasta sauce. Way good!